Due to our knowledgeable professionals in this industry and clients centric approach, we have been able to be the prime choice of our clients. 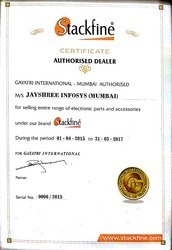 We at Jayshree Infosys are Wholesalers & Distributor of Stackfine Products in Mumbai, Maharashtra. We have made a strong business association with the industries most reckoned and reliable vendors, from whom, we make procurement of the entire gamut. The selection process has been carried out by our experts after conducting detailed market surveys. They have made a selection on the basis of past track records, market expertise, ethical business dealings, quality of the products and timely delivery schedule of the vendors. Owing to our client friendly approach and strong business acumen, we are capable of attaining utmost satisfaction of our clients by presenting them an unbeatable quality array of products. In order to understand the needs and necessities of our customers in a satisfactory and efficient manner, we spent some quality time with them understanding their requisites. Besides this, our strict quality management policies, facility of customization and easy payment modes have helped us in attaining the highest level of customer credibility and trust. 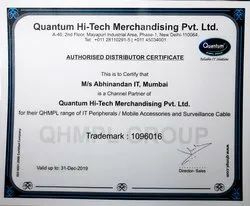 We at Jayshree Infosys are Wholesalers & Distributor of Quantum Products in Mumbai, Maharashtra.